It was life-changing. It was a new turning point for our registered NGO (non-governmental organisation) called UTHANGO Social Investments based here in Cape Town, South Africa, and for our clients. This blog is our record of the experiences we have as we pursue our dream to create a gateway for Africans into virtual worlds, and specifically into Second Life, as a starting point. We are indeed the very first registered African-based company – as far as we know and have been told – in virtual worlds. We strategically position ourselves in virtual worlds such as Second Life (R) to create awareness for our real world innovative programmes in sustainable development and established linkages. 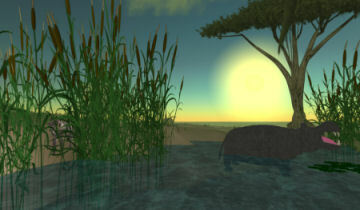 In September 2007, we met with the CEO and Co-Founder of Second Life, Philip Rosedale on the island ‘VIRTUAL AFRICA’ and shared our dreams – spelling out the challenges of access and connectivity for Africans. We indicated our willingness as a company to work closely with any corporate entity and individuals seeking to bridge this divide to ensure that Africa is represented in the revolution to create 3D worlds. We have had our share of hard lessons learned and opportunity cost, and learn daily what it takes to be effective and productive in a 3D environment shared with avatars – both make-believe digital and representations of real people from real companies and communities. UTHANGO is some times asked, ‘what does a non-profit do in virtual worlds’ and ‘are you not better off in the real world addressing poverty’: Our answer always remains the same: “It is not an either or for us; we need to be in both areas to use technology and its innovative edge to make a difference in the lives of our beneficiaries”. Our challenge is to find resources to make it possible to show real world gain and integration via virtual worlds access, and we hope that the courage shown, will be contagious. We invite you to walk with us and shape our thinking… We are in a position to also ‘bring other companies and professionals in-world’ and offer our assistance to other non-profit organisations (at a nominal negotiated fee) that would like to establish a global presence as an affiliate of Virtual Africa. Come visit us in South Africa as part of a volunteer programme or when you are touring the country. Or, just come and visit us in virtual reality! Click on the Picture beneath to Teleport to our Office. (You must be registered at Second Life as part of this Visit and please make sure you have some bandwidth available and the necessary computer specifications). We invite you to contact us via our website if you are interested to collaborate in this initiative. We have a special call to angel investors and corporate social investment companies that would like to team up with us to make this all possible for Africa. We are exploring the use of mobile technology linked to virtual worlds at the moment, and are excited about the potential… Uthango’s presence in Second Life (R) is directly related to create a platform for African content development in virtual worlds, as well as exploring the value of virtual worlds for collaboration between educators, businesses and other professionals. Musicians, artists and enterpreneurs from Africa could benefit tremendously from having access to virtual worlds, and it is our vision to make it easier, affordable and most of all, effective to participate in the global community for real world gain. We have to say that the best value proposition by UTHANGO, is the fact that we work directly in communities in Africa – with extensive profiling and engagement processes – and also in virtual worlds. The ability to transfer knowledge between worlds is one that we build upon each time we log into a virtual world, or walk into a village or township here in Africa. We love our organisation’s role in both worlds passionately. Find us on the flip side of life where we seek to innovate and create solutions that are different… I think it was Einstein who said (roughly remembered): “If we continue to do the same things, we will get the same results”. We need to be bold and tackle development differently – in a way to attract investment to Africa and to ensure that Africa’s contribution to the world is recognised by using the latest technology in the best possible way. Excellent, well thought out, and very well written posts have made your blog both a pleasure to read and a source of valuable information. I’m Edita Kaye, editor in chief of iVinnie.com the number one virtual world news network and I also have the great privilege to be the founder of the Association of Virtual Worlds. I believe that your blog would be of great interest and benefit to our readers and have linked to it through iVinne.com’s growing blog network. I would very much appreciate it if you would link back. Welcome and thank you for writing “the best blog”. iVinnie.com aggregates news of virtual worlds, MMORPGs, 3D-Web, and more… the trends, people, and technology that are the future. Love what your are doing. Am a huge SL fan and have great ideas for what can be done to build Africa’s exposure to the world (the positive side, not the starving and hungry children only side). Keep up the good work. Will visit in SL soon.